I waited in suspense. They say it would open as a better and refurbished one. Launching was exactly at this hour. Well, the minute passed. Nothing, wait hold on, a little delay, almost there, blah blah blah. I had to leave to get to my day. When I came back, I saw it. Huh? There were sponsors on the right side. Up there were what I thought were just categories. I clicked. A new post, yes. But the old posts in the category were all there. Hmm. So what was changed that took 2 months? Then there were kudos of congratulations. It was awesome, a girl said. Really good. Duh. 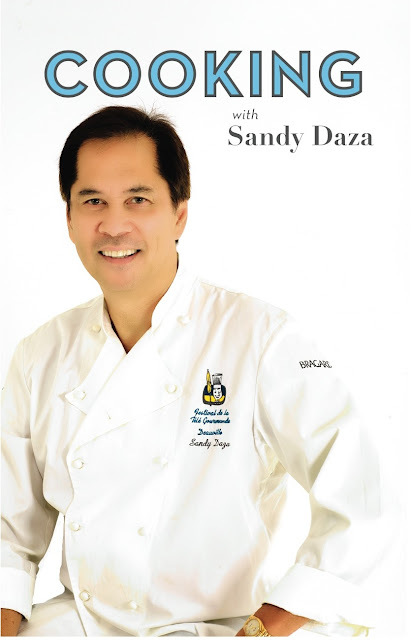 In the bookstore, I saw Sandy Daza’s new cookbook. Small, thin, simple white covering with his picture in front. 185 pesos. Hmm. Grabbed it and paid for it, still in its plastic covering, mistake. When I ripped open, I knew I would regret buying. I did. Newsprint, simple common recipes, bouillon cube is an ingredient, and no pictures. Wow, another disappointment in the same day. His blog http://sandydaza.blogspot.com/ has the recipes from the book, with pictures. Simple but exalted. Then an icon in brown newsprint. Irony. I don’t want to say more, you may think I am dissing them. No! Damn no. I want them to be right and grand. I am not happy I am disappointed. I wish the blog is spectacular and I will hang out a lot there. I wish that even if its newsprint, the recipes are cool, innovative and delicious. Well, now I can do a cook through easily and simply. But I am not using a bouillon cube, excuse me. I admire people out there saving the environment, feeding the hungry people of Africa, and protecting the endangered whales of the seas. They are so awesome, taking care of other things than themselves. At one point in my life, I have been called to public service and did my tour. That was the time of the earthquake and erupting volcanoes. Nowadays, my area of responsibility is smaller. I take care of my daughter, my recuperating mother, my clients’ needs, a soon to open office with partners. Yeah, those are others, and also a significant one that is part of my life now. So I focus more now on the homefront and myself. The operative word being, myself. I guess its a phase. I want to have the full awareness of this time, to embrace what’s going on and come out of it like I milked it with every wonderful experience I could. Let’s say, a year? 12 months of taking care of myself, learning about me and letting me be the best that I can be. I take on shaping myself as a project. Wellness is a priority, as in my next meal undergoes change as my body cannot take food from fast food and restaurants with a lot of additive, flavor enhancers named “spices” and MSG. I feel sick immediately after eating and it takes several days a lot of antihistamine to get the toxins out. Moving the yoga way. I make my practice a personal one. I do it privately. I haven’t joined a class. There is a club nearby I can go, maybe in a few months as I expand my hours out of the home. Study up. My book shelves are full of stuff I want to read on. Personal care. I am too lazy to keep up with my regimens. Now is the time to get back into the ritual. Work takes a lot of my time too these days. That is fun as I like what I do. With my project, our new office is about to open up, so there is a lot to do. Later on, travel and seeing places. I hope to have a home church too within this time, to nourish my spiritual growth. That’s a good list of things to focus on in the coming months of 2012. Before writing this post, I have been feeling quite guilty as I think its selfish. But I am glad I made this decision and said my declarations.